FLINT — The Mott Bruin All-Star Classic volleyball game didn’t fail to impress fans in the Steve Schmidt Gymnasium at Mott Community College’s Ballenger Fieldhouse on Tuesday night. The two rosters were packed with 20 all-league and conference talents. There were a handful of girls present that signed with colleges to pursue their volleyball careers. volleyball coach Bob Halbedel was treated, as he sat back and watched four of his newcomers play together on the Gold team. Halbedel said he would also keep a close eye on players who haven’t signed. Emily Peel of Mt. Morris, Katie Kortas of Armada, Chris Burt of Swartz Creek and Raylynn Coghlan of Rochester got to know each other a little better as teammates — all four will be Mott Bears next season. Patrick Hayes | The Flint JournalChris Burt while at Swartz Creek. Coghlan will room with Kortas in the fall. She said that she had prior opportunities to play with her future colleagues in Sunday camps, and she is eager to join them. The Gold team was swept by the Grey — 25-12, 25-23, 25-14, 25-22 and 25-15. Burt was named the Gold’s MVP. Although official stats weren’t kept, she was estimated to have had 18 service points and eight kills collectively. She also played in the Bruin All-Star Classic softball game Monday night at Whaley Park. The Grey team’s MVP was Sara Hayes of Grand Blanc. 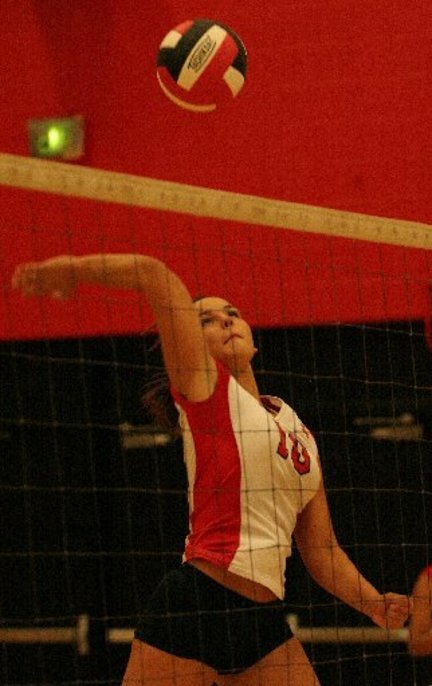 She will attend Kellogg University this fall, and was said to have at least 63 assists by a match official. Hayes found herself against Lauren Mora — a fellow Bobcat and soon-to-be Madonna Community College player. It was the same dueling-teammate scenario for two Mt. Morris Panthers, Peel and Kelsey Schempf. But it’s not everyday that bitter rivals join forces. Fenton’s Hannah Taylor and Linden’s Mackenzie Prince helped lead the Grey team as outside hitters. And now, Prince has a new-found appreciation for her former high school foe. “Hannah was the energy on our team today,” Prince said. “She was all over the place. It was a lot of fun to play with her.” Not only did Taylor show her talent on the court and receive a compliment from an Eagle, but she put her vocal range on display when she sang the pre-game National Anthem. Mott has had a 40-year tradition of hosting the all-star gala, and its athletic director Tom Healey has been in attendance for the last 13 years. He’s not just an administrator, he’s also a fan. Healey tipped his hat to his coaches and volunteers who have worked to make the showcase a success.